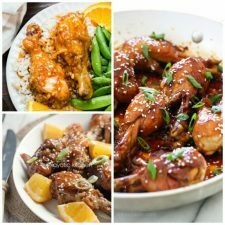 Slow Cooked Apricot Ribs cook all day in a flavorful sauce and then get browned for a few minutes under a hot broiler for an easy version of slow cooker ribs that I bet your family would love! Click here to see The BEST Slow Cooker Ribs Recipes! Click here to see The BEST Instant Pot Ribs Recipes! 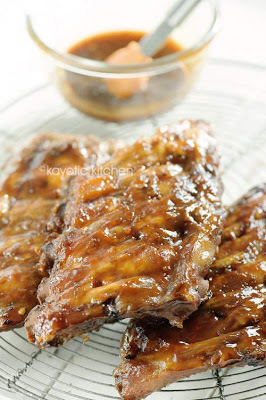 In this recipe spareribs are cooked all day in the slow cooker in a sauce with apricot preserves, soy sauce, and a perfect-sounding mix of seasonings, and then they they get browned under a hot broiler for about 5 minutes when you’re ready to eat. This recipe sounds absolutely delicious to me too, and if you’re a fan of ribs I bet you’ll love them! Get the complete recipe for Slow Cooked Apricot Ribs from Kayotic Kitchen. Click here to see all the Pork Recipes!